Sound Technology Ltd are pleased to announce distribution and immediate availability of Hamer Guitars in the UK & ROI. Considered by many to be the first “boutique” guitar brand, Hamer Guitars was founded in 1973 by vintage guitar shop owners Paul Hamer and Jol Dantzig. Since 2017, the Hamer brand has been under the ownership of JAM Industries, with the 2018/19 product line-up consisting of six models based on classic Hamer designs and much-loved custom shop models. Based on the original Hamer flat top Sunburst models from late 1970s, the new Hamer Sunburst (£699 RRP inc VAT) blends an old-soul with best-in-class specification. The body shape and neckjoint are based on the sought-after vintage Hamer originals. The new Sunburst features flamed maple over a solid mahogany body and a period-authentic sunburst finish. The new Hamer Monaco Korina (£679 RRP inc VAT) is based on a very limited edition, much-sought-after, Hamer custom shop model from 2005. Just like that guitar, the new Monaco Korina features a solid korina single cut body and korina neck with ebony fretboard and jumbo frets. 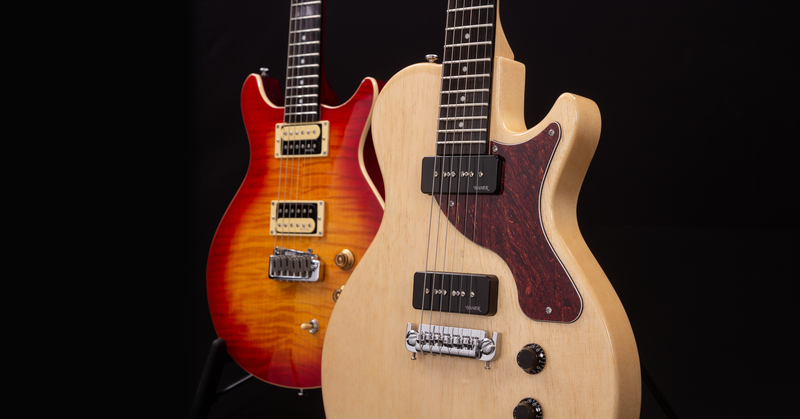 The two soapbar P90 pickups and wrap-around Wilkinson bridge deliver a warm and versatile tone and all the sustain of much heavier mahogany solid body guitars. The Hamer Monaco (£799 RRP inc VAT) is a comfortable carved top single cutaway design built with a solid maple cap on a mahogany body and a set neck for great tone. The Monaco is visually stunning with a Cherry Sunburst figured maple veneer and it features a smooth playing mahogany set-neck and an ebony fingerboard that features classy victory inlays. The Hamer Archtop (£699 RRP inc VAT) and Hamer Archtop Tremolo (£749 RRP inc VAT) are based on the Hamer Studio body, the third classic Hamer design introduced in 1977. Upgraded with a solid maple top on a mahogany body, the tone is beefy yet focused and the Transparent Black (Archtop) and Dark Cherry Burst (Archtop Tremolo) finishes on figured maple veneer, result in two visually inspiring instruments. The Hamer Special Jr. (£529 RRP inc VAT) is based on a slightly downscaled version of the Hamer Sunburst, originally released in 1980. Built with a full depth dovetail neck joint and fitted with a Hamer Dog Eared P-90, the Hamer Special Jr. provides resonance galore. All models are in stock now. Please visit our Hamer Guitars brand page or call Sound Technology Ltd on 01462 480000 for any further information.